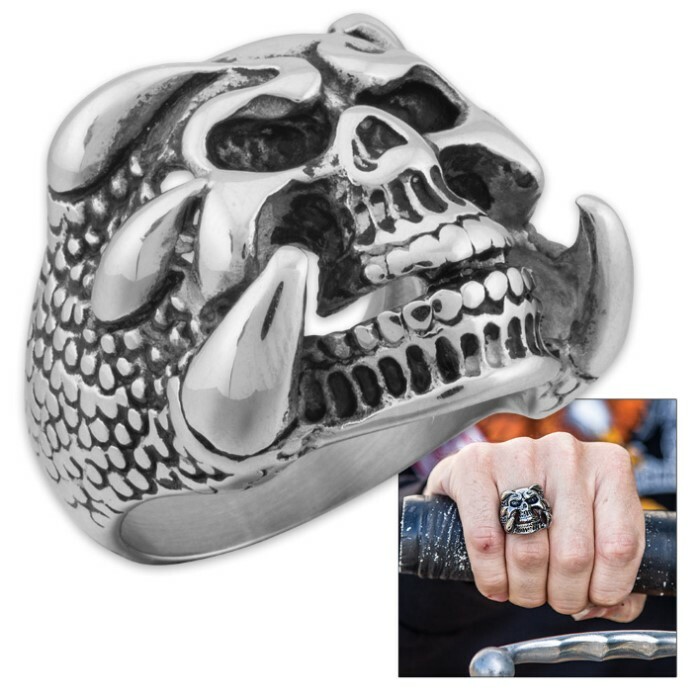 "Reptiphobia" - Scaly Clawed Hands Grasp Skull - Men's Stainless Steel Ring - Sizes 9-12 | BUDK.com - Knives & Swords At The Lowest Prices! 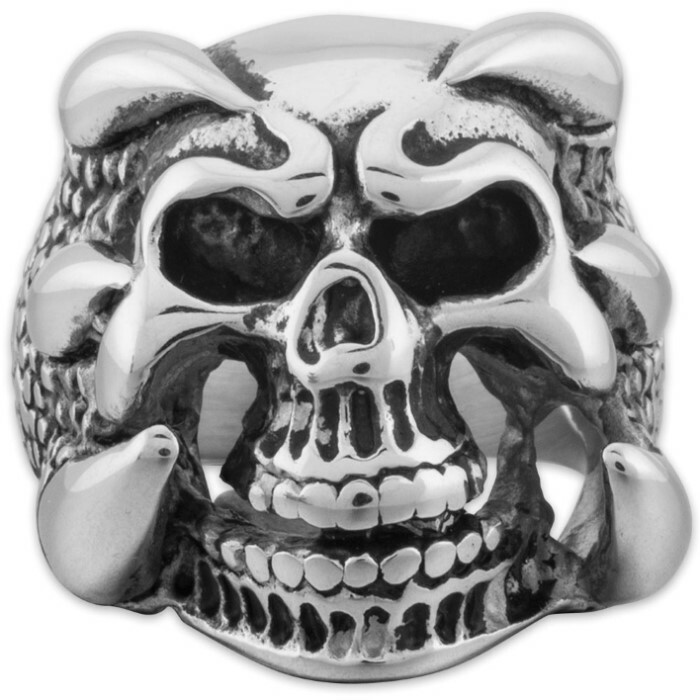 In this delightfully ghoulish stainless steel ring, ominous triclawed reptilian hands grasp the sides of a human skull. Razor sharp talons sink into bone, as the maniacal skull's brow furrows above black hollow eyes in apparent rage. Is the dark soul that inhabits this bony vessel angry at his demonic captors? Is he not mad at all - simply flinching in fiendish torment, instead? Feel free to let your imagination decide! Regardless, the attention to detail in this fine piece of men's jewelry is extraordinary. Delicate splashes of black afford brilliant contrast and delicate shadows against the dazzling mirror polished stainless steel. The clever effect makes minute features like teeth, scales and even near-microscopic sinus ridges pop with breathtaking radiance. 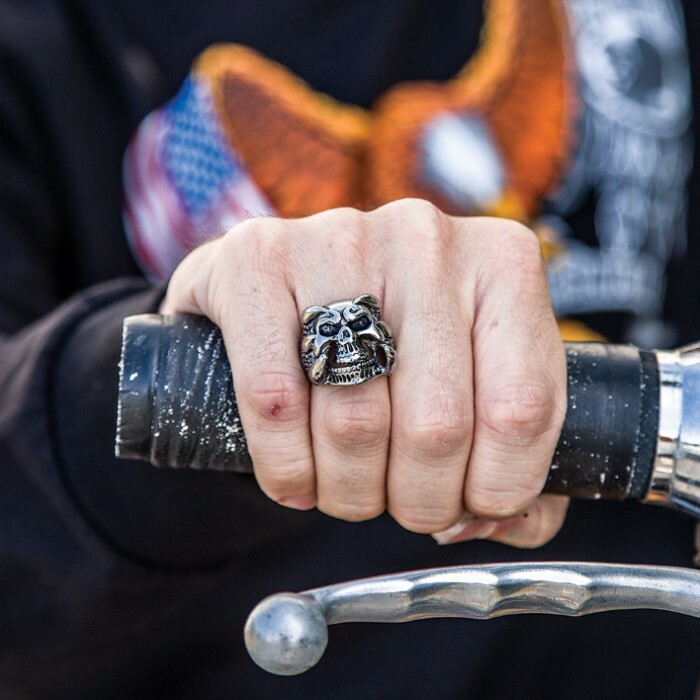 Perfect for bikers, goths or anyone whose sense of style leans toward the dark side, this bleak-chic ring is unapologetically macabre and in-your-face. Its stainless steel construction boasts a sheen, corrosion resistance and durability that simply can't be matched by more traditional ring materials. Precious metals like silver and gold tarnish and fade, and even advanced modern ceramics are prone to chipping. But the "Reptiphobia" Ring is truly forged for a lifetime of vigorous wear, so you needn’t fear damage while performing carpentry, vehicle repair/maintenance and other hands-on work. Available in sizes 9-12, we’ve got the right fit for any man. The Reptiphobia Men’s Stainless Steel Ring makes a fantastic, memorable gift, and you won’t find better prices on high quality jewelry like this anywhere else!